We took off today with a goal of only two shops. This seems to keep us from taking on too much. For those of you not already playing along, my 10 year old son and I have been making our way through the entire Northern Illinois Shop Hop – 32 shops. Today we hit the half-way mark. And I really can’t complain about how long it’s taken, or whether or not it’s been enjoyable. Some days, I feel like my son…just get me out of here. Some days, we enjoy spending the time together. Today, mainly because we have limited ourselves to just two stores, we had an enjoyable trip. They are located at a very busy intersection. Your GPS will get you close, but I had to call to find out exactly where they were. They are a Bernina dealer, who also carries fabric and yarn…something I have not seen anywhere along the way on the shop hop. Plenty of fabrics to choose, but we were in and out pretty quick. 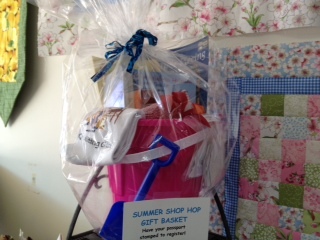 They did not have a basket made up yet for the shop hop raffle. What I bought: Fatquarters. I’m becoming predictable. Our next stop was Wild Birds Unlimited in Lisle. This is one of our favorite little suburban treasures. We have backyard feeders and love our birds and critters. This is the place to stock up on basics, but we have purchased all our feeders from them as well as all our bird food. They have a great selection of feeders and I highly recommend the Woodpecker blend of food. On to the next shop! A cute little shop in the very heart of downtown Downers Grove. Parking is a little crowded on a Friday at noon, but we found a spot around the corner. Very friendly staff, they suggested that my son could start quilting and might be interested in a book by Joe Cunningham, “Men and the Art of Quiltmaking”. Their basket is a cheery pink sand bucket and matching sand shovel. See below. Before heading home we found another Egg Harbor Cafe in Downers Grove, right next to where we parked, so of course, that’s where we ate lunch. All in all, a good morning! This entry was posted in Blogging, midwest, Northern Illinois Shop Hop, Piecing and tagged Egg Harbor Cafe, men quilting, Northern Illinois Quilt Shop Hop, Wild Birds Unilmited by edges. Bookmark the permalink.